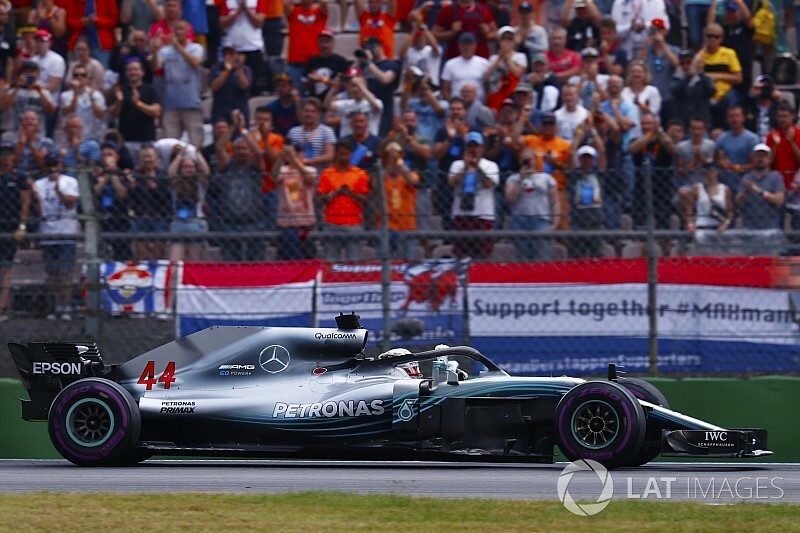 Lewis Hamilton was repeatedly pushed over the team radio to go to the finish line at the German Grand Prix, as Mercedes covered his base in case of a time penalty for crossing the pit entry line. Although the World Champion was eventually insulted in the 52nd round with a reprimand as he drove into the pits, radio links with the pit wall revealed how Mercedes was paying attention to the risk of punishment while the race was still taking place. After Mercedes had already canceled Hamilton's fight with his team-mate Valtteri Bottas and the Finn, who fell back slowly, the team actually refused to let the engine shut down in the final stages. In fact, Hamilton's engineer Peter Bonnington urged Hamilton to continue building. There was a gap over Botta's lap time. And on the last lap, Hamilton received several messages to hit hard, so as not to waste time. This news alerts Hamilton, who, shortly after taking the checkered flag, asked if he had already received a penalty. "Do I have a penalty?" Hamilton asked. His race engineer Peter Bonnington replied, "Negative, negative, we only cover base relatives." Talking about the argument for Hamilton to extend his advantage over Bottas, Mercedes CEO Toto Wolff said: "We've covered all the bases, you know those things. [There] There's quite a bit of room for interpretation, we just wanted that far as far as possible disappear in the distance. " 9659003] An edited transcript of how the talks between Hamilton and his race engineer Peter Bonnington took place in the closing stages of the German Grand Prix can be found below. PETER BONNINGTON: So Vettel off. Yellow, yellow. Yellow, yellow. Attention. Attention. Vettel off. So yellow, yellow. Yellow, yellow. PB: So box, box. Box, box. Make the gap. So far to Valtteri.
] PB: Stay outside, stay outside. In, in, in, in, in, in, in, in. LH: Are we in trouble? PB: Negative, negative. So stay outside. PB: Strat Mode 3. Strat Mode 3. LH: Can I start the engine [radio interference makes message unclear]? PB: Negative Lewis. Let's just stay where we are. This rain danger still exists. PB: Lewis. Go Strat Mode 3, Strat Mode 3. Build this gap. Currently four seconds. PB: Two more laps. Just continue building. PB: Strat Mode 5 Lewis. Currently in 6th Strat Mode 5. PB: We need you to build the gap. PB: Lewis, keep pushing the line. PB: Continue to push the line. LH: Do I have a penalty? PB: Negative, negative. We only cover bases Mate.